Edith Starkaline Wright was born on August 22, 1923 in Chapin, South Carolina, daughter of the late Magnolia Koon Reaves and John W. Reaves. She was educated in the Chapin Public School system. Edith was a member of her family’s church, St. John A.M.E. Church in Chapin, South Carolina. In 1942, she relocated to New Jersey. She was a loving, dedicated mother who worked very hard to support her family. Her work ethic was impeccable. She retired shortly before her 80th birthday. Edith enjoyed going to bingo games and Atlantic City in her spare time. She was also well-known for her photographic memory. She would assist family members with any information they required about our family history. On Monday, August 27, 2018, Edith Starkaline Wright departed this life at Overlook Hospital in Summit, New Jersey at the age of 95. 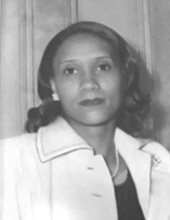 She was predeceased by her husband, Willis Wright; son, Barry Wright; stepdaughter, Bertha Lane; step-son, Willis Wright, Jr. and nine siblings. Edith Starkaline Wright leaves to cherish fond memories, her children: John W. Reaves of Chapin, South Carolina, Dennis Wright of Somerset, New Jersey, Denise Wright of East Orange, New Jersey, Kathy Wright-Fowler of Scotch Plains, New Jersey and Gayle Wright of Cranford, New Jersey; seven grandchildren: Rameek Wright, Shaliek Moore, Felisha Wright, Steven Fowler, John Mayers, Cheryl Mayers and Michael Williams; seven great-grandchildren; along with a host of nieces, nephews, and friends. To send flowers or a remembrance gift to the family of Edith Starkaline Wright, please visit our Tribute Store. "Email Address" would like to share the life celebration of Edith Starkaline Wright. Click on the "link" to go to share a favorite memory or leave a condolence message for the family.